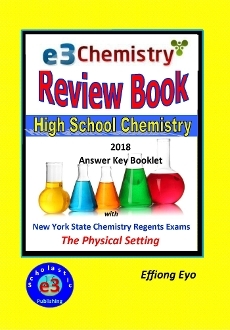 This is the Answer Key Booklet to the 2018 Edition E3 Chemistry Review Book. Teachers get free copies with every class order. When you place a class order, do not add this to your order. We will include up to 4 copies (depending on your order quantity) in the shipment. If you are buying our review book for yourself, you should get the Home Edition of the book. The School Edition does not have answers in the book. This Answer Key is for the School edition. Please Be Advised: ALL SALES (from this site, Amazon, Barnes and Nobles. etc) go through us. If a teacher is supicious of a student buying the Home Edition, we can find out and inform the teacher upon request. Please do not buy the Home Edition or the Answer Key Booklet if you are not supposed to do so. Thanks.